Short selling is the process of selling a stock that you do not already own. The principle reason why you would want to do this is because you think the company is overvalued and you want to make a bet that it will decline in value in the future. You may also want to short a stock in order to hedge your other long positions. While it can sound confusing to sell something that isn’t yours, just remember that short selling is part of a free, capitalist market and is made possible by brokers, who act as intermediaries between investors and the exchange. When you want to short a stock, your broker will lend you the shares, either from it’s own inventory or one of it’s partners. Once you borrow the shares from your broker you can sell them at the market price and be compensated if the stock falls in value. Meanwhile, you will lose money if the stock rises in value. At some point you will need to close, or cover, your short position by buying back the same number of shares that you sold and thereby returning them to your broker. You can usually hold on to your short positions indefinitely, however, you will be likely be charged interest for each share you’ve sold and will also be liable to pay dividends on those shares. Over the years I have done a lot of research into shorting stocks and I’ve realised that there are actually not many profitable methods available. I have tested lots of different ideas; from moving average crossovers, mean reversion strategies, volatility strategies etc. But most of the time shorting stocks is a losers game since stocks have a long-term upward bias. However, even though stocks tend to go higher over the long-term, it is still true that many companies crash and burn and on short-term time horizons price movement can be very volatile. The best strategy I have found for shorting stocks is to look for companies that have had a significant run-up on heavy volume and then short them when they are extremely overbought. Specifically, I am looking for a stock that has been bought up so aggressively – with each price bar becoming larger than the last – that the chart begins to look like a parabola. 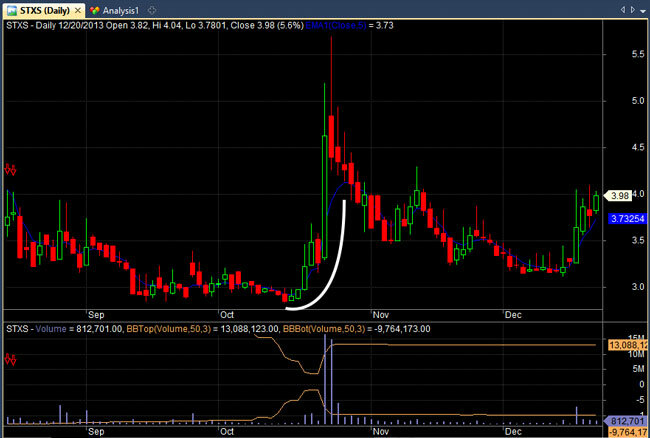 When this occurs you can draw a quarter circle around the pattern and then it appears as though the stock is going up almost vertically. Volume should also spike significantly higher on the upward move. 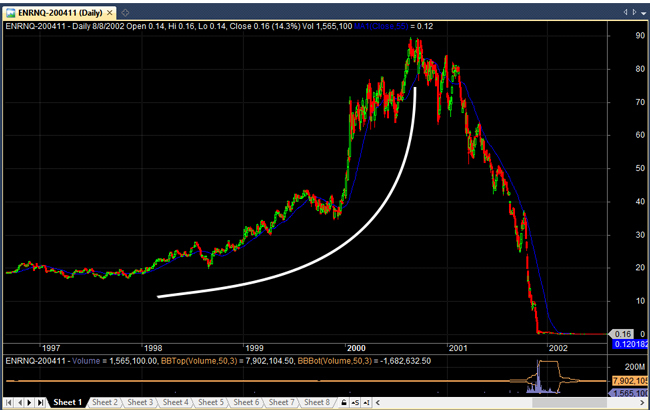 Some traders like to call these types of stock patterns Supernovae while I prefer to just call them parabolic trades. No stock can go up forever, so when these patterns occur, they are very often followed by a swift reversal. This move is exacerbated by long traders taking their profits and as volume declines. The strategy recorded an extremely high win rate of 90% with an average profit/loss of 4.62% and a maximum drawdown of -11%. However, the strategy only produced a handful of trades. Thus it was necessary to widen the universe and broaden the criteria somewhat for test two. The rules above provide a simple framework for finding short trades. My own settings are very similar but I found that some tiny tweaks can improve the strategy even further. In addition, the holding period was set at five days and all trade entries were made on the next day open. Capital was set at $100,000 with the equity split twenty times between each position. A maximum portfolio size of 10 shorts was selected and commissions were set at $0.01 per share. 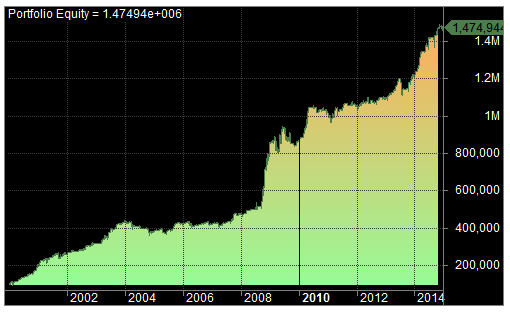 Running this strategy on the Russell 3000 universe between 1/1/2000 and 1/1/2015 produced an annualised return of 19.65% with a maximum drawdown of -17.47% and a win rate of 64%. 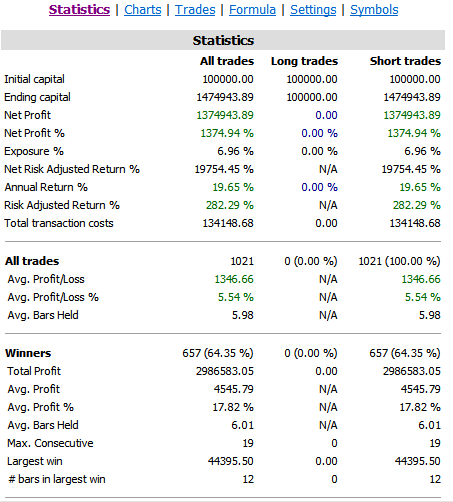 The average profit/loss per trade was 5.54%. So on the face of it these are good results. You can see that the short trade was entered on the open on the 23rd October (red down arrow) and closed 5 days later for a profit (green up arrow). 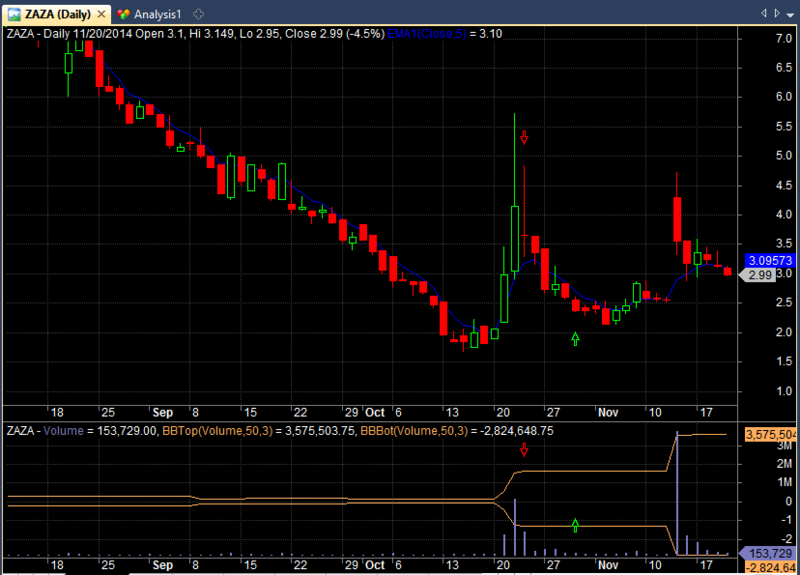 You can also see that volume spiked significantly higher on the up move and then died down. You can also see that the stock was in a longer-term downward trend when the pop-up took place. 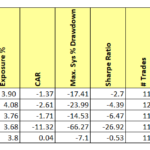 These are all factors that contribute to profitable shorts. Thus far the results from this simple test have been good and could even be improved with more sophisticated rules and money management. However, it must be remembered that simulations involving short trades are also more complex and therefore not necessarily as accurate as for long trade simulations – due to the limitations and difficulties involved in shorting. It is not nearly as easy to find stocks to short as it is to buy. Some brokers don’t allow short selling and some do not have much of an inventory. In my experience, good brokers for shorting stocks are Interactive Brokers and Sure Trader. 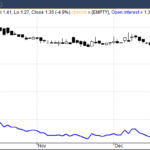 However, my personal choice for shorting shares is IG Index, which is a UK-based spread betting company. The selection of companies is not as wide as with Interactive Brokers, but there are still plenty of opportunities to choose from. There are many different stock screeners around that will let you locate these types of ‘supernovae/parabolic’ stocks. • Avoid shorting a stock near it’s dividend date. If you sell at the wrong time you will be liable to pay the yield to your broker. • Don’t get too greedy. 20%-30% profit is a good target to shoot for with this method. • It stands to reason that speculative businesses or stocks in riskier industries will be more volatile investments and therefore better shorts. For example, gold mining companies, oil explorers, early stage biotech companies with no revenue etc. • Don’t get sucked into shorting penny stocks with low volume and wide spreads. These spreads will kill you as you might need to make 10% , 20% in profit just to break even. Stick to the criteria above. • Don’t short a stock when volume is still increasing. The time to short is when the volume dies back and the stock begins to take a rest. • Read the news to understand why the stock has shot up in the first place. This will give you a better idea of whether the move is an over-reaction or not. • Keep an eye on the momentum and price movement of the stock to better determine your entry. You want to short when momentum and enthusiasm is slowing down. • Use margin to leverage your short trades but be very conservative. Don’t risk more than 1% of your capital. • Be careful shorting stocks when the broader market is significantly oversold as this can lead to sharp short squeezes and when the broader market rallies the tide can lift all boats. (Such as in 2009). • It sometimes helps to keep an eye on StockTwits to gauge the sentiment behind the stock in question. If the sentiment ratio is declining it suggests traders are probably looking to book profits. • Stocks in long-term down trends, that have spiked higher, normally make the best shorts. Stock prices can be explosive on the upside as well as the downside and often, significant price moves can take place overnight. That’s why it’s critical you risk only small amounts, no more than 1%. There are always extra issues when shorting stocks than there are going long. Slippage can be a bigger issue and there are not always enough shares available from the broker to short. This means the real results may not be as accurate as shown here. That said, this technique for finding supernova stocks and shorting them looks to have some merit. A simple, cash-only simulation found there was a profitable expectancy between 2000 and 2015 for the rules tested. By introducing conservative levels of margin and following some extra rules, this strategy could well be a good one for traders looking to find profitable shorts. 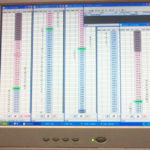 Simulations in this article run with Amibroker using data from Norgate Premium Data. (Includes historical constituents). 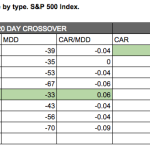 These are hypothetical results and may not reflect real trading. Please see the disclaimer. Can you please share the AFL you used to backtest this strategy? @goodetrades is a great trader. Many of the guys/girls who follow @investorslive on twitter will give a heads up on these parabolic plays (“supernovae” if you follow @timothysykes). I like to follow @DerrickJLeon’s advice (http://derricktrades.blogspot.com/) to only short on lower highs and use those lower highs as stop loss guides. Yes, I agree it’s good to look for lower highs, maybe on the daily or hourly chart. VLTC looks like a possibility, and PBMD, but I wouldn’t call NDRM a ‘supernova’? I tweeted about MCUR yesterday and it’s dropped -26% since. Unfortunately, I was unable to find shares to short. Hi Lee, all choices have advantages and disadvantages. 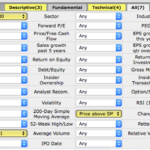 You can short SPY, go long SH or SDS, buy puts, buy LEAP puts, short using CFDs, future or spreadbet. There will always be some cost involved. My broker of choice is Interactive Brokers and you can do all of the above with IB and cheaper than most other brokers. What makes you so sure the market will collapse? JB, thanks for sharing this. I’ve been searching for a good hedge for my portfolio. I tried to reproduce this strategy and got different results for a backtest from 1/1/2000 – 1/1/2015 on the Russell 3000. I got 8.1% CAR and 29% DD. I noticed that my version only has 242 trades whereas yours has > 1000. Could you take a quick look at my AB code and let me know if I missed something? Thank you!… really appreciate all of the articles that you write. Hard to say, this is quite an old article and I was using different data source. Do you have historical constituents? I’m using Norgate Premium Data. It doesn’t have historical constituents but Norgate just released a new data product that does; I’ll be upgrading soon. What data were you using?